You can offer your customers a monetary, percentage, or shipping discounts on a product, collection, or variant in your store. Simply get Shopify's BULK DISCOUNT free app to generate or import many discount codes at once. Export the generate code files for syncing with Eber. 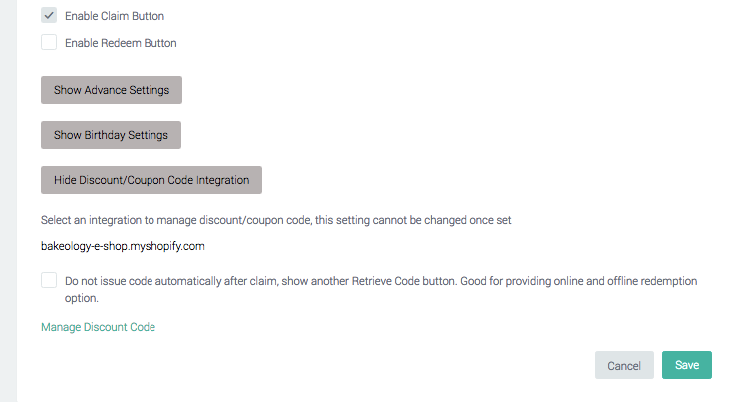 enter all require information and select to allow [enable claim/redeem button] on member Web App, click on [Show discount/coupon code integration], Select the Shopify store and Save. Return to page and click on [manage discount codes]> upload discount codes file to "Shopify Coupon codes" and [import codes]. Refresh page and you will be able to see all code you have imported in screen. Your codes are ready to be use with Eber member system.